As an example, biological activity can be expressed quantitatively as the concentration of a substance required to give a certain biological response. Additionally, when physicochemical properties or structures are expressed by numbers, one can find a mathematical relationship, or quantitative structure-activity relationship, between the two. The mathematical expression, if carefully validated  can then be used to predict the modeled response of other chemical structures. 3D-QSAR refers to the application of force field calculations requiring three-dimensional structures, e.g. 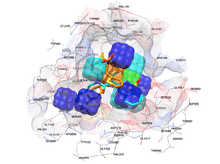 based on protein crystallography or molecule superimposition. It uses computed potentials, e.g. the Lennard-Jones potential, rather than experimental constants and is concerned with the overall molecule rather than a single substituent. It examines the steric fields (shape of the molecule), the hydrophobic regions (water-soluble surfaces), and the electrostatic fields. On June 18, 2011 the Comparative Molecular Field Analysis (CoMFA) patent has dropped any restriction on the use of GRID and partial least-squares (PLS) technologies and the Rome Center for Molecular Design (RCMD) team (www.rcmd.it) has opened a 3D QSAR web server (www.3d-qsar.com) based on the 3-D QSAutogrid/R engine. GOLPE stands for Generating Optimal Linear PLS Estimations. 3-D QSAutogrid/R covers all the main features of CoMFA and GRID/GOLPE with implementation by multiprobe/multiregion variable selection (MPGRS) that improves the simplification of interpretation of the 3-D QSAR map. The methodology is based on the integration of the molecular interaction fields as calculated by AutoGrid and the R statistical environment that can be easily coupled with many free graphical molecular interfaces such as UCSF-Chimera, AutoDock Tools, JMol and others. 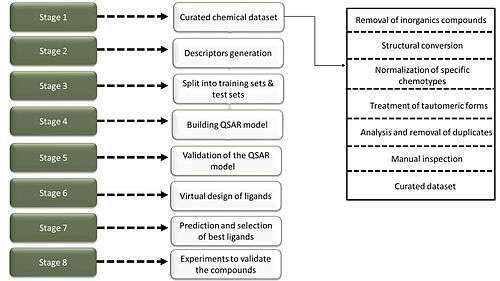 Different aspects of validation of QSAR models that need attention includes methods of selection of training set compounds, setting training set size and impact of variable selection for training set models for determining the quality of prediction. Development of novel validation parameters for judging quality of QSAR models is also important. 7. AZOrange RT, SVM, ANN, and RF "AZCompTox/AZOrange: AstraZeneca add-ons to Orange.". GitHub. ↑ Nantasenamat C, Isarankura-Na-Ayudhya C, Prachayasittikul V (Jul 2010). "Advances in computational methods to predict the biological activity of compounds". Expert Opinion on Drug Discovery. 5 (7): 633–54. doi:10.1517/17460441.2010.492827. PMID 22823204. 1 2 Yousefinejad S, Hemmateenejad B (2015). "Chemometrics tools in QSAR/QSPR studies: A historical perspective". Chemometrics and Intelligent Laboratory Systems. 149, Part B: 177–204. doi:10.1016/j.chemolab.2015.06.016. 1 2 Tropsha A, Gramatica P, Gombar VJ (2003). "The Importance of Being Earnest: Validation is the Absolute Essential for Successful Application and Interpretation of QSPR Models". QSAR &Comb. Sci. 22: 69–77. doi:10.1002/qsar.200390007. 1 2 Gramatica P (2007). "Principles of QSAR models validation: internal and external". QSAR &Comb. Sci. 26: 694–701. doi:10.1002/qsar.200610151. 1 2 3 Chirico N, Gramatica P (Aug 2012). "Real external predictivity of QSAR models. Part 2. New intercomparable thresholds for different validation criteria and the need for scatter plot inspection". Journal of Chemical Information and Modeling. 52 (8): 2044–58. doi:10.1021/ci300084j. PMID 22721530. ↑ Tropsha, Alexander (2010). "Best Practices for QSAR Model Development, Validation, and Exploitation". Molecular Informatics. 29 (6-7): 476–488. doi:10.1002/minf.201000061. ISSN 1868-1743. ↑ Patani GA, LaVoie EJ (Dec 1996). "Bioisosterism: A Rational Approach in Drug Design". Chemical Reviews. 96 (8): 3147–3176. doi:10.1021/cr950066q. PMID 11848856. ↑ Thompson SJ, Hattotuwagama CK, Holliday JD, Flower DR (2006). "On the hydrophobicity of peptides: Comparing empirical predictions of peptide log P values". Bioinformation. 1 (7): 237–41. doi:10.6026/97320630001237. PMC 1891704 . PMID 17597897. ↑ Wildman SA, Crippen GM (1999). "Prediction of physicochemical parameters by atomic contributions". J. Chem. Inf. Comput. Sci. 39 (5): 868–873. doi:10.1021/ci990307l. 1 2 Ajmani S, Jadhav K, Kulkarni SA. "Group-Based QSAR (G-QSAR)". ↑ Manoharan P, Vijayan RS, Ghoshal N (Oct 2010). "Rationalizing fragment based drug discovery for BACE1: insights from FB-QSAR, FB-QSSR, multi objective (MO-QSPR) and MIF studies". Journal of Computer-Aided Molecular Design. 24 (10): 843–64. Bibcode:2010JCAMD..24..843M. doi:10.1007/s10822-010-9378-9. PMID 20740315. 1 2 Prasanth Kumar S, Jasrai YT, Pandya HA, Rawal RM (November 2013). "Pharmacophore-similarity-based QSAR (PS-QSAR) for group-specific biological activity predictions". Journal of Biomolecular Structure & Dynamics. 33 (1): 56–69. doi:10.1080/07391102.2013.849618. PMID 24266725. ↑ Cheeseright T. "The Identification of Bioisosteres as Drug Development Candidates" (PDF). Cresset BioMolecular Discovery. ↑ Leach AR (2001). Molecular modelling: principles and applications. Englewood Cliffs, N.J: Prentice Hall. ISBN 0-582-38210-6. ↑ Vert JP, Schölkopf B, Tsuda K (2004). Kernel methods in computational biology. Cambridge, Mass: MIT Press. ISBN 0-262-19509-7. ↑ Dietterich TG, Lathrop RH, Lozano-Pérez T (1997). "Solving the multiple instance problem with axis-parallel rectangles". Artificial Intelligence. 89 (1–2): 31–71. doi:10.1016/S0004-3702(96)00034-3. ↑ Ballante F, Ragno R (Jun 2012). "3-D QSAutogrid/R: an alternative procedure to build 3-D QSAR models. Methodologies and applications". Journal of Chemical Information and Modeling. 52 (6): 1674–85. doi:10.1021/ci300123x. PMID 22643034. ↑ Caruthers JM, Lauterbach JA, Thomson KT, Venkatasubramanian V, Snively CM, Bhan A, Katare S, Oskarsdottir G (2003). "Catalyst design: knowledge extraction from high-throughput experimentation". J. Catal. 216: 3776–3777. doi:10.1016/S0021-9517(02)00036-2. ↑ Manz TA, Phomphrai K, Medvedev G, Krishnamurthy BB, Sharma S, Haq J, Novstrup KA, Thomson KT, Delgass WN, Caruthers JM, Abu-Omar MM (Apr 2007). "Structure-activity correlation in titanium single-site olefin polymerization catalysts containing mixed cyclopentadienyl/aryloxide ligation". Journal of the American Chemical Society. 129 (13): 3776–7. doi:10.1021/ja0640849. PMID 17348648. ↑ Manz TA, Caruthers JM, Sharma S, Phomphrai K, Thomson KT, Delgass WN, Abu-Omar MM (2012). "Structure–Activity Correlation for Relative Chain Initiation to Propagation Rates in Single-Site Olefin Polymerization Catalysis". Organometallics. 31 (2): 602–618. doi:10.1021/om200884x. ↑ Gusfield D (1997). Algorithms on strings, trees, and sequences: computer science and computational biology. Cambridge, UK: Cambridge University Press. ISBN 0-521-58519-8. ↑ Helma C (2005). Predictive toxicology. Washington, DC: Taylor & Francis. ISBN 0-8247-2397-X. ↑ Tong W, Hong H, Xie Q, Shi L, Fang H, Perkins R (April 2005). "Assessing QSAR Limitations – A Regulatory Perspective". Current Computer-Aided Drug Design. 1 (2): 195–205. doi:10.2174/1573409053585663. ↑ Dearden JC (2003). "In silico prediction of drug toxicity". Journal of Computer-Aided Molecular Design. 17 (2-4): 119–27. Bibcode:2003JCAMD..17..119D. doi:10.1023/A:1025361621494. PMID 13677480. ↑ Wold S, Eriksson L (1995). "Statistical validation of QSAR results". In Waterbeemd, Han van de. Chemometric methods in molecular design. Weinheim: VCH. pp. 309–318. ISBN 3-527-30044-9. ↑ Roy K (Dec 2007). "On some aspects of validation of predictive quantitative structure-activity relationship models". Expert Opinion on Drug Discovery. 2 (12): 1567–77. doi:10.1517/17460441.2.12.1567. ↑ Leonard JT, Roy K (2006). "On selection of training and test sets for the development of predictive QSAR models". QSAR & Combinatorial Science. 25 (3): 235–251. doi:10.1002/qsar.200510161. ↑ Roy PP, Leonard JT, Roy K (2008). "Exploring the impact of size of training sets for the development of predictive QSAR models". Chemometrics and Intelligent Laboratory Systems. 90 (1): 31–42. doi:10.1016/j.chemolab.2007.07.004. ↑ Put R, Vander Heyden Y (Oct 2007). "Review on modelling aspects in reversed-phase liquid chromatographic quantitative structure-retention relationships". Analytica Chimica Acta. 602 (2): 164–72. doi:10.1016/j.aca.2007.09.014. PMID 17933600. ↑ Pratim Roy P, Paul S, Mitra I, Roy K (2009). "On two novel parameters for validation of predictive QSAR models". Molecules. 14 (5): 1660–701. doi:10.3390/molecules14051660. PMID 19471190. ↑ Chirico N, Gramatica P (Sep 2011). "Real external predictivity of QSAR models: how to evaluate it? Comparison of different validation criteria and proposal of using the concordance correlation coefficient". Journal of Chemical Information and Modeling. 51 (9): 2320–35. doi:10.1021/ci200211n. PMID 21800825. ↑ Rouvray DH, Bonchev D (1991). Chemical graph theory: introduction and fundamentals. Tunbridge Wells, Kent, England: Abacus Press. ISBN 0-85626-454-7. ↑ Fraczkiewicz, R (2013). "In Silico Prediction of Ionization". In Reedijk, J. Reference Module in Chemistry, Molecular Sciences and Chemical Engineering [Online]. vol. 5. Amsterdam, The Netherlands: Elsevier. doi:10.1016/B978-0-12-409547-2.02610-X. ↑ Freyhult EK, Andersson K, Gustafsson MG (Apr 2003). "Structural modeling extends QSAR analysis of antibody-lysozyme interactions to 3D-QSAR". Biophysical Journal. 84 (4): 2264–72. Bibcode:2003BpJ....84.2264F. doi:10.1016/S0006-3495(03)75032-2. PMC 1302793 . PMID 12668435. ↑ Timmerman H, Todeschini R, Consonni V, Mannhold R, Kubinyi H (2002). Handbook of Molecular Descriptors. Weinheim: Wiley-VCH. ISBN 3-527-29913-0. ↑ Lavecchia A (Mar 2015). "Machine-learning approaches in drug discovery: methods and applications". Drug Discovery Today. 20 (3): 318–31. doi:10.1016/j.drudis.2014.10.012. PMID 25448759. ↑ Stålring JC, Carlsson LA, Almeida P, Boyer S (2011). "AZOrange - High performance open source machine learning for QSAR modeling in a graphical programming environment". Journal of Cheminformatics. 3: 28. doi:10.1186/1758-2946-3-28. PMC 3158423 . PMID 21798025. Selassie CD (2003). "History of Quantitative Structure-Activity Relationships" (PDF). In Abraham DJ. Burger's medicinal Chemistry and Drug Discovery. 1 (6th ed.). New York: Wiley. pp. 1–48. ISBN 0-471-27401-1. Shityakov S, Puskás I, Roewer N, Förster C, Broscheit J (2014). "Three-dimensional quantitative structure-activity relationship and docking studies in a series of anthocyanin derivatives as cytochrome P450 3A4 inhibitors". Advances and Applications in Bioinformatics and Chemistry. 7: 11–21. doi:10.2147/AABC.S56478. PMC 3970920 . PMID 24741320.